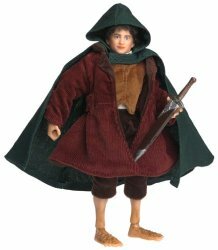 Vivid Imaginations has launched a special edition collectors series of dolls based on characters from the new Lord of the Rings movie. The Frodo doll is wonderfully packaged and it really was a shame to open it to get at its contents. However, once we carefully opened the box, we were not disappointed. He comes complete with his own sword, scabbard and backpack. His clothes are also wonderfully designed and will look great in any fans collection. However he is just a doll, and as such some of the guys in the office were against playing with him. Whether or not these 'collector's editions' will ever be worth anything is debatable, but for the time being they look great and are a must have for fans of the movie.